Home Jobs By Mom - Insights. Ideas. Improvements. Convincing your Teen of anything that you think is best for them is usually a difficult task. The simple act of forbidding something usually makes them desire the item more. This applies to everything, including tattoos. With tattoos being very popular at this time, convincing your teen not to alter their body permanently will take some clever parenting skills. Ask your teen if they think their tattoo theme is still going to apply to their life down the road. Ask them if they believe that the tattoo they want will impact their future. Could it prevent them from getting a good job or meeting the right partner? While this type of debate usually just results in them groaning at you or rolling their eyes, these thoughts will stay in the back of their head when they think about this tattoo. In most cases, you need to combine this option with one other from the list to make it most effective. This tactic should scare them into reconsidering their choice. Show them pictures of infected tattoos and explain what type of reconstructive surgery has to be performed to correct the area. Trust me, they won’t want to take anti-inflammatory painkillers forever. Show them severely scared people who had infected tattoos and had to have plastic surgery. Explain the potential to contract Hepatitis or AIDS from dirty tattoo needles. Tell your teen that you agree with their decision to use body art as a way to express themselves, but that you think temporary tattoos may be a more reasonable action. Explain to them that this will provide them with a way to express themselves, while not permanently attaching that expression to their body. You can let them know that this alternative also provides them a way to change their expressions over time as they grow as a person and experience different things. Tell them how expensive it is to have a tattoo removed and how it scars the body. Explain to them that tattoo removal is painful and usually requires several sessions. Also, explain that these surgeries are not guaranteed to be 100 percent successful. They can end up with a disfigured tattoo on them, which will look way worse. Embarrass your teen into thinking more seriously about getting a tattoo by telling them that you will get a matching one. This usually makes your teen stop whatever they are planning and run. Whenever a parent wants to become that involved in a teens “personal” life, they usually opt for something else. In the end, whether you use any of these tips or a method of your own, it is important that you stress to your teen how reckless it is to place permanent, scarring tattoos on their body. Let them know that what seems cool now can really impact their future. 2/2/18 We are adding a small deck to our back porch. They should be done sometime next week, hopefully. I can’t wait for the mud to be gone! Oreo will be sad about that LOL. 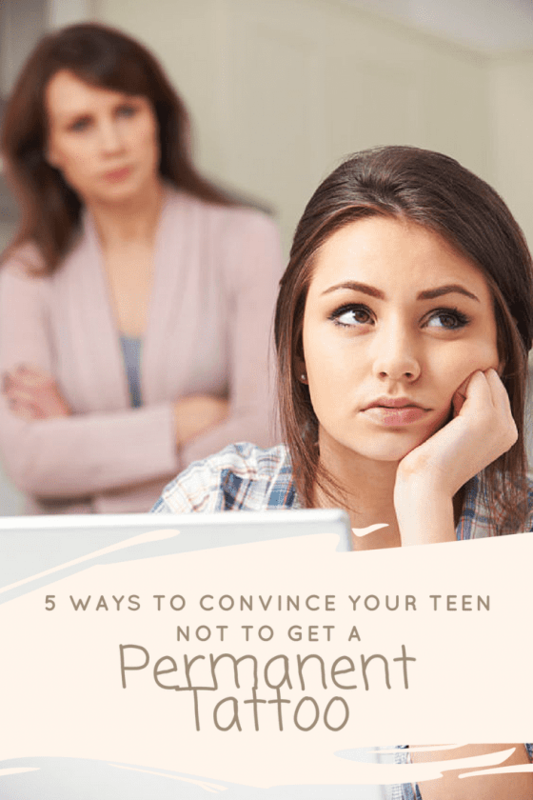 The post 5 Ways To Convince Your Teen Not To Get A Permanent Tattoo appeared first on Home Jobs by MOM. Subscribe to Home Jobs By Mom - Insights. Ideas. Improvements.